Low-Fat Chocolate Tried And Tested: Is It As Good As The Real Deal? Low-Fat Chocolate: Have All Our Dreams Finally Come True? About three years ago, scientists announced that they had discovered the secret to making low-fat, tasty, chocolate. The theory was that if you replaced the fattening ingredients – in the case of chocolate, that’s cream and butter – with water you’d have low-calorie chocolate that tasted delish. 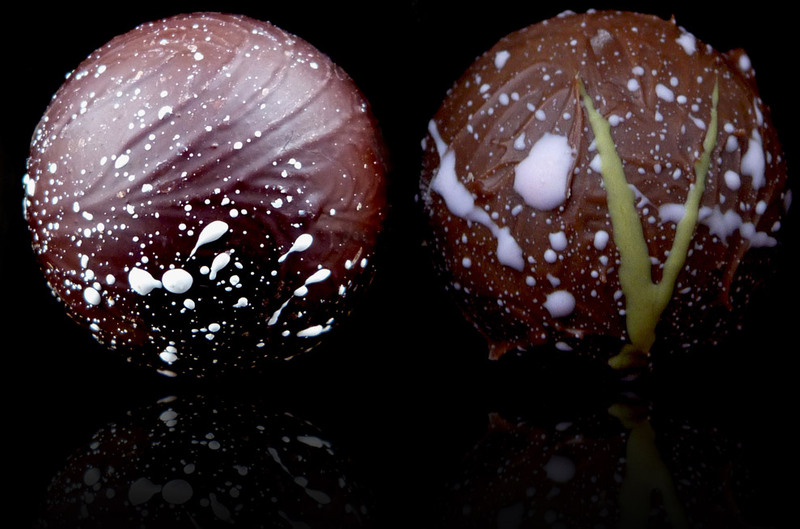 Aneesh Popat is a chocolatier to some of the best Michelin starred restaurants and has accidentally harnessed that exact theory and created a range of truffles that contain half the calories of normal chocolates. Being total chocolate fiends, we just had to put Mr Popat’s water ganache to the test. But first, we caught up with the chocolatier to get the lowdown on this game-changing sweet treat. How did the low-calorie chocolates come about? My intention never was to create a low calorie chocolate truffle. The aim for making my water ganache was always focused on creating pure flavour. Cream and butter create a thick blanket which masks the subtle notes in the chocolate. So by removing these and instead using water, a flavourless liquid, gave a cleaner chocolate taste experience and then none of the fat left on the palate after. But how come they still taste so creamy and chocolatey? Essentially in a water ganache you have particles of chocolate suspended in water. As long as each particle is smaller than your taste buds, your brain cannot sense them and hence assumes the mouth can feel creaminess! So you get all the sensual pleasure, only the taste of chocolate and 40-50% fewer calories. We’ve tried low-fat chocolate before and they’ve all tasted like cardboard, why don’t these? I set out to make something that was tastier and purer than any other chocolate. I never even thought about calories. When setting out to make something low fat, I would assume the first thought would be to remove the fat. Mine was quite different. My first thought was, ‘What is hindering the flavour of chocolate from coming through? Now cut it out’. It just happened to be the fat. I make zero compromise on the quality of flavour. What flavours do the truffles come in? They come in every flavour you can imagine. I am heavily influenced by my Indian background, pride for Britain and the seasonality of nature. Using knowledge of the aroma compounds within an ingredient I chemically pair two items together to make exciting and experimental flavour combinations. For example, rose and cinnamon, pineapple and cardamom, banana and clove. Recently we were asked by Penhaligon’s to make a chocolate for HRH Maharaja of Jodhpur, India. The brief was to create something reminiscent of the monsoon soils of India to match their new fragrance Vaara. We used rose with quince, honey, saffron and vanilla. Do you have plans for anymore low-calorie chocolates? The current milk chocolate salted caramel water ganache has only 38 calories which is 52% lower than the average commercially available truffle (78 calories). I am working to lower this further to potentially 20 or 25 calories. Perfect for the post-Christmas low calorie diets! Why suffer when you don’t have to? ‘Though it had all the flavour and texture of a full-cal chocolate, the choice of infusions made it taste a little like potpourri, or what it might be like to enjoy a box of chocolates at a garden centre. I’d definitely choose a box of these chocs as a low calorie alternative though.’ Becky Freeth, online assistant. ‘I’m a chocolate girl through-and-though, so The Chocolatier’s new low-fat range was music to my ears. But is it actually good? I was pleasantly surprised. My pineapple and cardamom piece was light, fruity and not too sweet – the perfect after-dinner treat.’ Eleanor Young, deputy online editor. ‘It’s safe to say I approached this experiment with a healthy dose of scepticism. Luxury low-fat chocolate that tastes great? Pull the other one. I tried out the fresh basil leaf white chocolate truffle and, while the savoury herb flavour wasn’t what I would ordinarily choose for a sweet treat, there’s no denying the ganache was light and tasty. If I hadn’t have already known, I would have thought it was a full-fat choccy.’ Suzannah Ramsdale, online features editor. The water ganaches are available at The Chocolatier – £19.95 for a box of 12 and £34.95 for a box of 24.